As radiologists, we were frustrated with our PACS. It was slow, expensive, and hard to customize. So we designed ClariPACS, a fast, modern cloud DICOM viewer. • Works in your web browser. No software or plugins to install. View full DICOM cases from home. • Share. Create multimedia reports and email links to full DICOM studies. • Collaborate. Discuss cases in real-time over the cloud using screen share mode. • Search. Quickly find cases by diagnosis and notes. • Intuitive screen management. Create custom layouts and bookmark states for presentation & teaching. • Fast. Smart pre-loading algorithm lets you start scrolling immediately. Lossless image compression. • Reliable. Automatic backups and security updates. No maintenance. Always the latest features. • No vendor lock-in. Download your data at any time in various formats (DCM, PNG, ZIP). • Versatile. Popular uses for ClariPACS include: non-diagnostic clinical PACS, teaching files, peer review, testing, radiology classes, resident call prep, and multi-site clinical trials. • HIPAA compliant. Fully HIPAA compliant for storing PHI (requires a signed business associate agreement). For teaching file use, HIPAA-compliant anonymization is automatically performed on all cases. ClariPACS makes sharing cases easy. Case links can be emailed. Links save the presentation state including layout, window/level settings, and annotations so recipients immediately see key findings. Cases can be password protected, or they can be public. Use screen share mode to discuss cases in real time. All participants can scroll and annotate images. 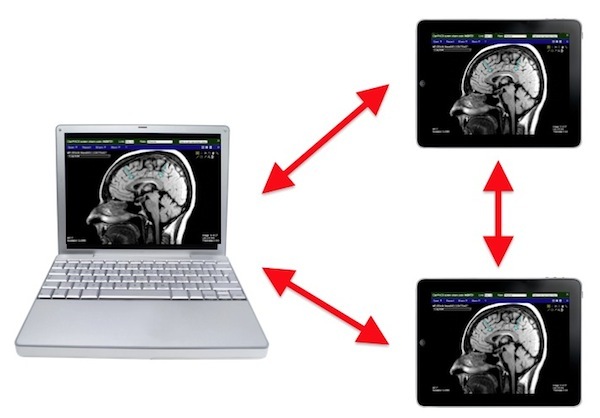 Unlike other screen share software, you can temporarily disconnect from the screen share to explore the study on your own, before rejoining the screen share. Many people can join a single screen share (limited by available network bandwidth), so it can be used in conferences as well as one-on-one consults. Screen share images are lossless compressed, full diagnostic quality. And since the images are preloaded on each person's computer, you can scroll quickly. That's something you can't get with generic screen share software. Create interactive radiology reports with text that link to key images (with annotations). Keep research studies separate from your clinical PACS. Set up a private research PACS in the cloud that can be accesible from multiple sites. Control what images and clinical information image reviewers can see. Record lesion measurements over time. Images are automatically anonymized and assigned a new accession number when uploaded. • Image post-processing. Current plug-ins include thick slabs, MIPs, texture analysis, 3D distance / angle / torsion angle measurments, and color liver perfusion imaging. Custom plugins may be created upon request. These plugins enable quantitative imaging, imaging biomarker, and radiogenomics studies. Imaging features can be correlated with pathology, molecular markers, genetic markers, prognosis, and treatment. Don't restrict yourself to static images. Create live radiology figures that have the full power of PACS. Use our authoring tools to annotate teaching cases and create modules for CME classes, conferences, journals, and department web pages. Check out the case below. This is an interactive 16-bit DICOM dataset. You can scroll, window/level, zoom, and drag the image. Double click on the image to fit it to the window. The image in the figure changes when you click on a link. 58 year old man presents with GI bleed. CT shows hemobilia from a ruptured left hepatic artery pseudoaneurysm. Scroll around the key images after clicking on the links. View the ClariPACS Getting started tutorial. View the help page for comprehensive information. One month free trial on the Starter plan. 10% discount for academic users. $100 bonus for referring a new ClariPACS customer. Custom plans are also available (see detailed price breakdown below). Note: The shared server in the starter plan may not have enough memory for certain image post-processing applications. Dedicated server capacity required for HIPAA compliance, if storing PHI. • ClariPACS web PACS with free software updates. • Use your own domain name (registered separately) or yourname.claripacs.com. • Unlimited users (but only as many users as the CPU, disk, and network bandwidth can handle). • Server: $900 / yr (shared server) or $3850 / yr (dedicated server). There is no hard limit on the number of simultaneous users, but the shared server can support around 3 simultaneous screen share users, and the dedicated server can support around 10 simultaneous screen share users. If you are interested in using ClariPACS, please contact us with a brief description of what you want to do. Join our low volume mailing list to receive product announcements.